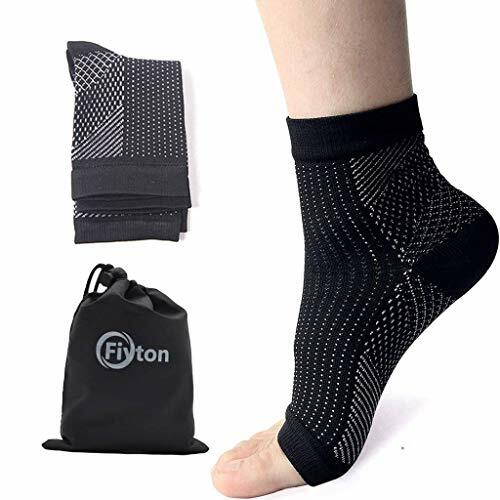 Material:Nylon,SpandexColor:BlackSize: Medium (S/M)Women: Shoe Sizes 6 - 9.5 Men: Shoe Sizes 5 - 9.5 Size: Large (L/XL)Women: Shoe Sizes 10 - 13.5 Men: Shoe Sizes 10 - 12.5Feature:*Combats symptoms of Plantar Fasciitis*Quick and convenient to wear*Not visible under your clothing*Unisex and fits either foot*Perfect compression sleeve for travel, sports, work, or home*Open toe design*Soothes and relieves achy heels and feetPackage included: 1 Pair Compression Foot SleeveNotice:* Please allow 1-3cm differs due to manual measurement *As different computers display colors differently, the color of the actual item may vary slightly from the above images. Thanks for your understanding! *If you\'re unsure which size to buy, try measuring a arm sleeve that you already own that fits you well, and compare those measurements to the size chart, lay the sleeve on a flat surface and use the above guide to measure the sleeve.